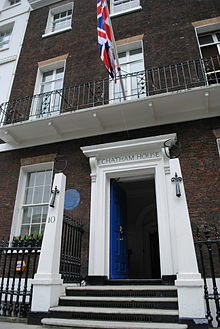 The Chatham House Rule is a system for holding debates and discussion panels on controversial issues, named after the headquarters of the UK Royal Institute of International Affairs, based in Chatham House, London, where the rule originated in June 1927. At a meeting held under the Chatham House Rule, anyone who comes to the meeting is free to use information from the discussion, but is not allowed to reveal who made any comment. It is designed to increase openness of discussion. Sometimes the reference is made to Chatham House rules. However, Chatham House states that the singular should be used as there is only one rule. The rule is designed to increase openness of discussion of public policy and current affairs, as it allows people to express and discuss controversial opinions and arguments without suffering the risk of stalling their career or even dismissal from their job, and with a clear separation from the opinion and the view of their employer. The rule allows people to speak as individuals and to express views that may not be those of their organisations, and therefore encourages free discussion. Speakers are free to voice their own opinions, and to contest the opinions of other participants, without concern for their personal reputation or their official duties and affiliations. The Chatham House Rule resolves a boundary problem faced by many communities of practice, in that it permits acknowledgement of the community or conversation, while protecting the freedom of interaction that is necessary for the community to carry out its conversations. It is designed to reduce the risk of what has come to be described as groupthink, where unpopular views are excluded from discussion, reducing the range of opinions an organisation can discuss. The aim of the rule is to guarantee anonymity to those speaking within its walls so that better international relations may be achieved. The rule is now used internationally as an aid to free discussion. The original rule of 1927 was refined in October 1992 and again in 2002. Chatham House has translated the rule into Arabic, Chinese, French, German, Portuguese, Spanish and Russian. The rule is a contrast (or a compromise) between private meetings, where revealing what was said in the meeting is forbidden, and on the record events where the discussion is completely public and attributed. Generally, the Chatham House Rule is imposed as a condition of being allowed to attend a meeting or event: all participants are understood to have agreed that it would be conducive to free discussion that they should be subject to the rule for the relevant part of the meeting. The success of the rule may depend upon it being considered morally binding, particularly in circumstances where a failure to comply with the rule may not result in sanction. In May 2015, the release of a rule-bound speech by European Central Bank board member Benoît Cœuré triggered broader attention to the bank's use of the system. The Cœuré speech influenced currency, stock and bond markets. In the aftermath, other recent ECB invocations of the rule regarding a question-and-answer session and opening remarks for Cœuré, respectively, by ECB Vice President Vitor Constancio and another member of the board, Peter Praet, also gained attention. An ECB governing council member Boštjan Jazbec of Slovenia also had, the same month, held a question-and-answer session under the rule. ^ a b "Chatham House Rule". About. UK: Chatham House. Retrieved 2014-07-14. ^ a b Fletcher, Laurence, "ECB error spurs questions about policy disclosures", MarketWatch, May 25, 2015. Retrieved 2015-05-26. ^ "Chatham House". Chatham House Rule. Chatham House. Retrieved 3 August 2016. ^ Rislakki, Jukka (February 24, 2011). "Informaatiouhat mietityttävät sekä virolaisia että suomalaisia" (in Finnish). Finland: Suomen Kuvalehti. Archived from the original on February 27, 2011. ^ "Chatham House Rule Translations", About us, Chatham House . ^ Jones, Claire; Fleming, Sam (20 May 2015). "Benoît Cœuré speech highlights central bank links to financiers - FT.com". Financial Times. Archived from the original on 2015-07-07. Retrieved 2016-02-11. ^ Black, Jeff; Worrachate, Anchalee (19 May 2015). "Hedge Fund Diners Get ECB's Market-Moving News Hours Early". Bloomberg Businessweek. Archived from the original on 2015-08-16. Retrieved 2016-02-11. ^ Spence, Peter (28 May 2015). "ECB told off by ombudsman for fumbling market moving speech". The Daily Telegraph. Archived from the original on 2015-12-01. Retrieved 2016-02-11. "Chatham House Rule". UK: Chatham House. Retrieved 2014-06-11. With explanation and link to translations in different languages. This page was last edited on 10 April 2019, at 21:31 (UTC).